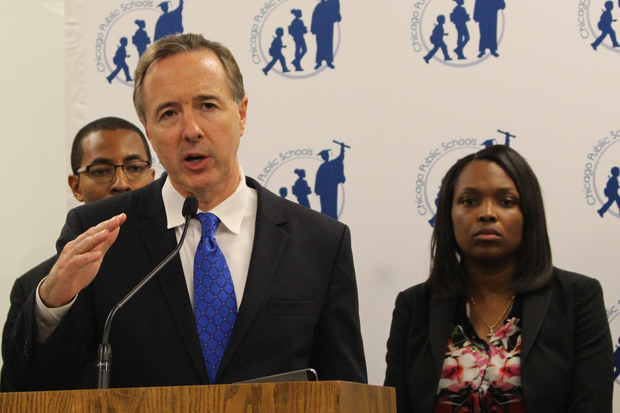 Chicago Public Schools CEO Forrest Claypool addresses the news media as Chief Education Officer Janice Jackson stands behind him in January. 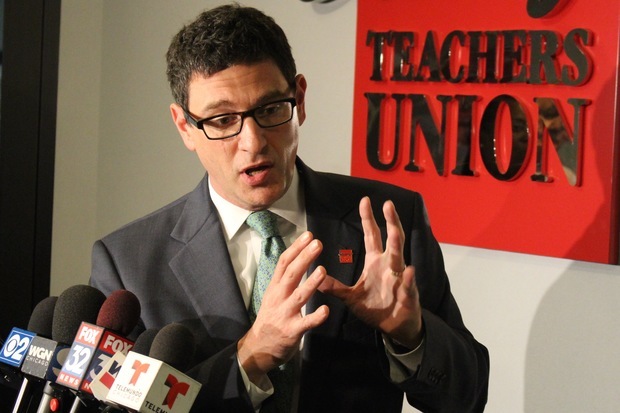 CHICAGO — Chicago Public Schools CEO Forrest Claypool is "unfit" to lead the district, Chicago Teachers Union Vice President Jesse Sharkey told DNAinfo Chicago Thursday. Three days after the teachers union reached a tentative agreement on a new contract with the district, Sharkey, the union's second in command, said Claypool had "run the system off the edge of a cliff." "He is unfit to be CEO," Sharkey said. "He has earned the contempt of teachers and parents across the city" by threatening mass layoffs and deep program cuts to schools. Sharkey, however, stopped short of calling for Claypool's ouster. Adam Collins, a spokesman for Mayor Rahm Emanuel, countered that Claypool "had been a remarkable leader at CPS" and is "the right person to build on the academic progress being made in our classrooms while improving CPS' finances." "This is the time we should be supporting of each other and fighting for fair funding in Springfield together," Collins said. Claypool, who served as the mayor's chief of staff before taking over the 380,000-student school district in July 2015, is "not knowledgeable about the education system,” Sharkey said. This year, Claypool has presided over 1,250 layoffs of teachers and support staff members and cuts of approximately $185 million as he sought to close what district officials said was a $1.1 billion budget deficit. Claypool replaced former CPS CEO Barbara Byrd-Bennett who pled guilty a year ago to taking bribes in return for steering a $23 million principal training contract to a firm where she worked before being tapped by Emanuel to lead the district in the wake of the 2012 teachers strike. One of the reasons the teachers union and school district officials were able to make a deal on a new contract minutes before a midnight Monday deadline was Claypool's absence from the bargaining table, Sharkey said. Instead, district administrators were represented in the negotiations that went down to the wire by Chief Education Officer Janice Jackson, who could be heard loudly proclaiming, "thank you, Jesus" once the deal was complete. Claypool was in the mayor's private office with Emanuel and school board President Frank Clark discussing the contract while the negotiations were taking place, Collins said. "That's exactly what you'd want the CEO of CPS to be doing in that situation," Collins said. Jackson, who became the district's second-highest ranking official in July 2015, served as principal of Westinghouse High School. A former social studies teacher at South Shore High School, Jackson is a graduate of Hyde Park High School. After the tentative agreement was announced by union President Karen Lewis, Claypool appeared alongside Emanuel in a hastily scheduled news conference at City Hall where he proclaimed schools would be "open for business" Tuesday morning. Before serving as Emanuel's top aide, Claypool served as president of the Chicago Transit Authority. Claypool previously served two terms as chief of staff to Emanuel's predecessor, Mayor Richard M. Daley, and headed the Chicago Park District in the 1990s. He served on the Cook County Board in the 2000s and ran unsuccessfully for board president and, later, as an independent against Joe Berrios for assessor in 2010 before Emanuel tapped him to lead the CTA. Sharkey has long been critical of Claypool, saying on the day of his appointment to lead CPS that he is a "political 'fixer' and longtime mayoral insider who represents another non-education, business-style manager of our schools."